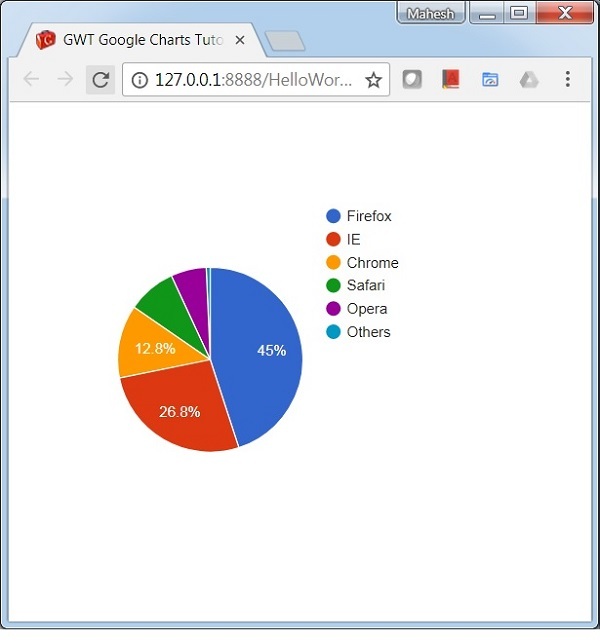 In this chapter, we will showcase the configuration required to draw a chart using the Google Charts API in GWT. 1 Create a project with a name HelloWorld under a package com.tutorialspoint as explained in the GWT - Create Application chapter. 2 Modify HelloWorld.gwt.xml, HelloWorld.html and HelloWorld.java as explained below. Keep rest of the files unchanged. 3 Compile and run the application to verify the result of the implemented logic. Following is the content of the modified module descriptor src/com.tutorialspoint/HelloWorld.gwt.xml. Following is the content of the modified HTML host file war/HelloWorld.html. We'll see the updated HelloWorld.java in the end after understanding configurations. Load the library using ChartLoader and then create the chart. Configure the details by creating a data table. Configure the width and height to be set. Step 3: Add the chart to parent panel. We're adding the chart to root panel.